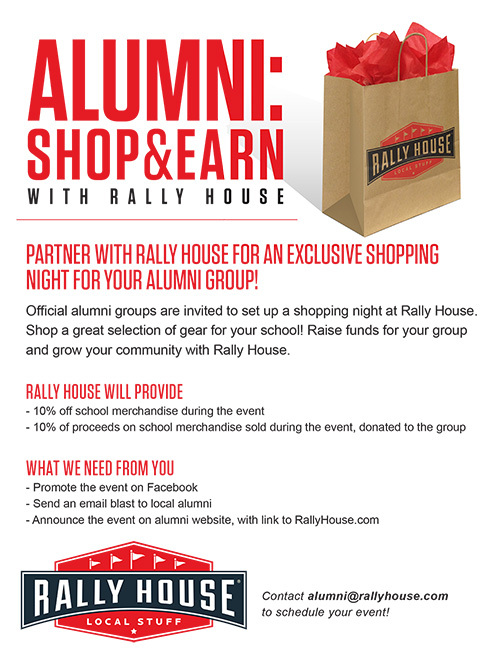 To learn more about our Alumni Shopping Nights, click on the flyer below. Rally House is a specialty team store that offers an expansive selection of NCAA, NFL, MLB, NBA, NHL & MLS apparel, t-shirts, hats, jerseys, jackets, gifts, gear & more. At Rally House you'll find unique college & pro merchandise for every fan. Our web site offers more than 85,000 different products with an average order size of $50. New products are added weekly. Ongoing customer promotions include Rally House Rewards and free shipping coupons for orders over $75. 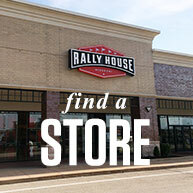 Rally House offers a competitive commission program where you can receive up to a 10% commission on each sale. Search Policy: We encourage affiliates to use our keywords in their search engine optimization. However, affiliates may not use our trademark name, our domain name or misspellings or variations of these. Please see our Program Terms for our detailed SEM policy. Technology that hides a coupon code and generates the affiliate click by revealing the code is prohibited. Show us your colors and signup today!